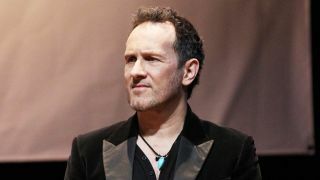 Def Leppard guitarist Vivian Campbell’s cancer has returned, he’s confirmed. Campbell, 52, was diagnosed with Hodgkin’s lymphoma in 2013 and last year announced he was in remission. But he’s now battling the condition again and will step back from his duties with the band. He says: “I’m saddened by the fact that my cancer has returned. However, I’m beyond consolation that its return will prevent me from being able to do my job for a while. Campbell’s treatment before last year’s remission included three rounds of chemotherapy and a stem cell transplant. Def Leppard have a string of live dates coming up, including a US trek and a UK jaunt with Whitesnake. Last year Trixter’s Steve Brown filled in for Campbell on Leppard’s live dates.